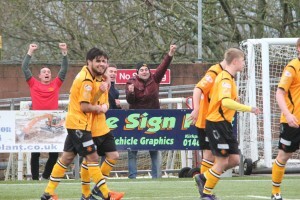 Annan secured the victory to keep their play off hopes firmly on track, a result which makes Clyde’s hopes of making the play offs difficult but not impossible. It was a wet windy miserable day which had some effect on the crowd but the Clyde faithful turned out in force to support their team knowing that a victory would keep their team firmly on the fringe of the play offs. The defeat however has only piled the pressure on Manager Barry Ferguson who was reported to have offered his resignation after the match as his team appear to have lost the momentum that they had prior to Christmas but with only one win in their last 10 matches Clyde appear to be on free fall. The only goal of the match came in the 74th minute following a Darren Ramsay corner which was flicked on by the head of Raffi Krissian to the back post where Max Wright connected to slam the ball into the roof of the net from 5 yards. It was the moment that decided the outcome of the game and for the third successive week Annan had delivered another one nil victory. It was the same team which started the match against Cowdenbeath which took the field and for the opening 15 minutes and playing with a strong wind in their favour Annan pushed forward. In the 3rd minute Weatherson flicked the ball into the path of McKenna who tested keeper Connor Quinn. Moments later Quinn denied Weatherson with an important save from the header. It was all Annan and in the 13th minute Ramsay finished a fluent Annan move with a low shot which Quinn did well to save and Weatherson following up failed to hit the target. It was a good opening from Annan but their failure to score during this period was a worry. Clyde soon started to show their attacking side of the game when David Gormley’s low shot from the edge of the box did not seriously trouble Blair Currie. Clyde had a good opportunity when Peter McDonald’s well struck shot pulled out a superb save from Currie and McDonald following up cracked the post. It was a let off for Annan and Currie once again denied Clyde when he pulled out another good save to deny Scott Ferguson in the 39th minute. Clyde were finishing the half well but Annan were unfortunate when Jordan Stewart’s free kick went narrowly over the bar. Clyde’s goal was under pressure at the start of the second half as Annan pushed forward and forced a couple of corners. Weatherson had the miss of the match when he uncharacteristically scooped the ball over the bar from 5 yards in the 48th minute as the Clyde defence failed to clear the well intended corner. Marc McKenzie went close when he forced a corner at the other end following a penetrating run to the heart of the Annan defence. The solitary goal came as a result of substitute Rabin Omar forcing a corner kick on the left and Darren Ramsay’s kick as previously stated was directed to the unmarked Max Wright who slammed the ball into the roof of the net from close range. Clyde almost replied immediately when McKenzie burst through forcing Currie into a save and form the rebound Krissian chested the ball out for a corner. It was a big win for Annan and it was a huge disappointment to Clyde who must pick themselves up but with 13 games and 39 points still to play for they could still make the play offs. Annan on the other hand have worked their way into a promising position and the challenge for them is to try and maintain the gap between them and the chasing pack as the season approaches the last quarter of the season. Arbroath reduced the gap at the top of the league with a convincing 4-1 victory over bottom of the table Cowdenbeath as title favourites Forfar could only manage a point against Montrose in a no score draw. Elgin City maintained their push for the title with a 1-0 victory at Shielfield Park and Stirling Albion eased their play off hopes with a 1-0 home victory over Edinburgh City. Annan travel to their closest rivals Montrose next Saturday. Annan Athletic : Blair Currie, Jean Guy Lucas, Jordan Stewart, Raffi Krissian , Steven Swinglehurst, Gavin Skelton, Max Wright , Darren Ramsay, Peter Weatherson, David McKenna (Aiden Smith 66 min), Nathan Flanagan (Rabin Omar 71 min) . Substitutes not used – Alex Mitchell, Smart Osadolar, Callum Home, Barry Cuddihy, Tom Fry. CLYDE : Connor Quinn, Ewan McNeil, Chris Smith, Scott Linton, Scott Ferguson, Scott McLauchlan, Sean Higgins, Marc McKenzie, Peter McDonald, David Gormley (Ryan Finnie 70 min). Substitutes not used John Gibson, Ross Perry, John Paul McGovern, Martin McNiff, Matty Flynn, Aaron Miller .